Professor Font’s paper offers an analysis of both the expected and, what is not the same thing, the hopedfor impacts of Latin America’s democratization and economic liberalization and integration on the Castro regime as the latter, having survived the Soviet collapse, seeks economic and political re-insertion into the region. Over the last two decades, Latin America has shed military dictatorships and statist approaches to economic development in favor of democracy and markets. The region’s economies are becoming integrated through international trade agreements, and these usually include democratic clauses requiring member countries to respect human rights and political liberties. This sea-change in the political economy of Latin America has taken place at a time when the Castro regime, its project for revolutionary internationalism having failed, is pursuing a foreign strategy designed to attract desperately needed capital and acquire or augment diplomatic support against the U.S. embargo, especially the Helms-Burton law. Re-establishing economic relations with Latin America and the Caribbean is part and parcel of this strategy. However, Cuba’s bid for membership in trade agreements is blocked by the democratic clauses the regime is required to meet. Professor Font explicitly lays out the dilemma faced by the Castro regime: either (a) democratize and hence risk losing political control in order to gain admission to Latin America’s trading blocs or (b) keep a tight grip on political life, but at the risk of regional marginalization and prolonged economic crisis eventually leading to political collapse. In analyzing this dilemma, the author seems to be of two minds. He is realistic enough to expect “a sustained international offensive by the Cuban authorities oriented to obtaining external support and resources to minimize the need for internal change.” In other words, far from democratizing in order to meet external conditions for support, the regime will attempt to coax international support in order to avoid having to give up any power at home. At the same time, the author is not without a certain naivete. In an ambiguous passage which I may be misinterpreting, and which I call on him to clarify, he appears to advocate admitting Cuba into regional organizations such as the OAS, the Inter-American Development Bank, NAFTA, etc., and “[t]he sooner, the better.” He seems to think that a mere “debate on a policy toward Cuba and its hemispheric integration” will increase the likelihood that the regime will “respond to the [political] challenge” to democratize [emphasis added]. In fairness to him, Font does say that “the first challenge in this wider context is to specify the conditions and processes under which Cuban society could have access to the changing Inter-American system.” But aren’t “the conditions and processes” already specified in the democratic clauses attached to international trade agreements? What if the regime continues to “claim to have already embraced a distinctive form of democracy billed as superior to others in the region in terms of social policies”? What then? Even less realistic is the author’s hope that if only the United States were to adopt “a fresh approach toward Cuba,” i.e., lift the embargo, “the island might face an international context so clearly favorable to overall liberalization that it would be a decisive test of the readiness of the current Cuban regime and society to change and embrace democracy.” As if “embracing democracy” did not involve a fundamental change in the very nature of the regime, a transformation that, if the transitions in Eastern Europe and Latin America are a guide, would, at a minimum, result in the removal of the Castro brothers and their subalterns from power, the release of political prisoners, the freeing of the press, and the carrying out of investigations that would expose the truth, long repressed and covered up with lies, of four decades of crimes, corruption, and sheer waste of resources. If the Castro regime faces a dilemma, so do the Latin American democracies. They want to admit Cuba to the developing inter-American community of democracy and trade, but the very nature of the regime, i.e., a centralized autocracy practicing an “extreme form of state socialism” fails to qualify for admission. So, the democracies either (a) require the regime to comply with the democratic clauses, which it won’t, therefore risking having to exclude Cuba from the region and being accused of subordinating their foreign policy to that of the United States or (b) admit the regime as is and hazard undermining their own commitment to democracy, a dangerous precedent in light of the region’s history of military dictatorships. In the face of this dilemma, the Latin American democracies have opted to pursue a rather tortuous course, calling on the regime to democratize while in fact tolerating it and, while not granting it formal admission to regional markets, nevertheless carrying on bilateral trade agreements with it. In fact, the 1999 Ibero-American Summit will take place in Cuba, the only country in the group ruled by a non-democratic regime. As the passages quoted above appear to imply, the author seemingly advocates taking this strategy still further, settling for minimalist or even cosmetic reforms in exchange for some sort of participation in trading blocs in the hope that Cuba’s insertion into on-going processes of economic integration will eventually cause the regime to undergo real democratization. As I acknowledged earlier, given the ambiguity of key passages, I may be misinterpreting him, so again I call on Professor Font to make his meaning clear. The author makes references to processes of democratization in Latin America and Eastern Europe, but does not analyze them in a systematic manner. All he offers is a list of “lessons” on how to promote the process of transition once it has begun. But these lessons do not help us analyze the likelihood of regime change in Cuba in light of the new political economy of Latin America. Part of the problem is that the author does not always consistently or clearly distinguish between regime and country, or rulers and ruled. In a democracy, where the government is the product of competitive elections and subject to public opinion, this is not a serious failing. But when dealing with a non-democratic regime, losing sight of this distinction is fatal for analytic integrity. In estimating the likelihood that the Castro regime will democratize, it is helpful to review the Latin American record on transitions. 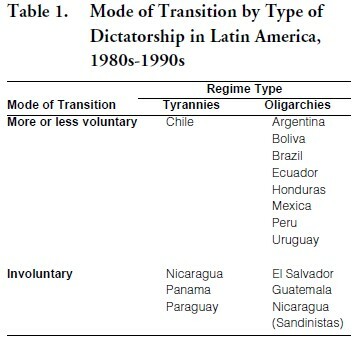 From the 1980s to the 1990s, dictatorship gave way to democracy, in part or in full, in 14 Ibero-American countries: Mexico, Guatemala, Honduras, El Salvador, Nicaragua, Panama, Ecuador, Peru, Bolivia, Paraguay, Brazil, Chile, Argentina, and Uruguay. All transitions were prompted by some sort of regime failure, political (loss of popular referendum, breakdown of elite consensus), economic (hyperinflation, default on international debts), or international (Argentina’s defeat in the Falklands/Malvinas war). Nevertheless, some regimes undertook to democratize more or less voluntarily while others had to be compelled to do so by force of arms, either civil war or external intervention (U.S. capture of Noriega in Panama). In seeking to understand why some dictatorships gave way voluntarily and others in the face of violence, it is instructive to distinguish between two types of dictatorial regimes: one-man dictatorship, or tyranny, and oligarchy. Tyranny is an autocracy identified with and dominated by one man for an extended period, say around ten years or more. An oligarchy, by contrast, is a dictatorship with collective or rotating leadership in which no one man dominates for any length of time. If this distribution is representative, it appears that, almost always, a tyrant clings to power at all costs, and it takes power to dislodge him. It could be that, psychologically, returning to private life is more difficult for a tyrant, who towers above all others, than for members of an oligarchy, accustomed as they are to exercise a smaller share of political power and for a shorter time. Knowing no equal in the state, a tyrant acquires habits of arrogance, insolence, and holding all opinions but his own in contempt. Once ousted, his usual fate is exile, for if he cannot abide loss of power, neither does the public feel safe with a former tyrant in their midst. If they cannot oust him by force, which is normally the only way he will go while alive, the people’s other option is to wait for death to take him. Although no Latin American tyrant died in office during this period, it may be noted that, a decade earlier, two Iberian tyrants—Franco of Spain and Salazar of Portugal— did die in office, and it was their deaths that paved the way for the restoration of democracy in those two countries, rather directly in Spain and in Portugal only after the Caetano interregnum and the military regime that overthrew it. An even earlier example comes from Venezuela. In 1935, General Juan Vicente Gómez, the legendary “tyrant of the Andes,” died, and was succeeded by a military oligarchy which within a decade gave way to the first—if short-lived—democratic government in that country’s history. Now in his early seventies, Fidel Castro could live another decade, and may yet break the world’s record for a tyrant’s tenure (on January 1, 1999, he will mark four decades in power). At his death it is very possible that his brother Raúl will attempt to seize the reins. How long he can hang on is an imponderable. Before his chances are summarily dismissed, one must note that in North Korea Kim Il Sung’s son has managed to keep the succession in the family, as did “Baby” Doc Duvalier in Haiti, who after “Papa” Doc died ruled for some fifteen years before his ouster. However, it is unlikely that Raúl will be able to rule like a tyrant. Once Fidel dies, even if Raúl succeeds him as head, the regime will begin to resemble an oligarchy. At that time, both the probability of democratization and, more to the point, that of a coup, will jump. In conclusion, trade or no trade, embargo or no embargo, the likelihood that the Castro regime will “embrace democracy” is nil. Tyrants are not prone to give up power voluntarily and Fidel Castro, being more tyrannical than most, is even less likely to do so, no matter how many carrots are offered by potential trade agreements. Only the stick can do the job. There being no chance of outside intervention, the only realistic hope for democratization before Fidel Castro’s death rests with the military. Such are the parameters of Cuba’s political dimension.